No, no, no, Lisa. If adults don't like their jobs, they don't go on strike. They just go in every day and do it really half-assed. When I first heard that Marge was joining the police academy, I thought it would be fun and zany, like that movie Spaceballs. But instead it was dark and disturbing. Like that movie -- Police Academy. I've got more trophies than Wayne Gretzky & The Pope combined! Haven't you learned anything from that guy that gives those sermons in church? Captain What's-his-name. We live in a society of laws, why do you think I took you to see all those Police Academy movies? For fun? Well I didn't hear anybody laughing! Did you? Except at that guy who made sound effects. Vroom! Beep! Honk! Honk! Ha-ha. Where was I? Oh yeah, stay out of my booze! Let us celebrate our agreement with the adding of chocolate to milk. I'm not popular enough to be different. Look, all I'm saying is, if these big stars didn't want people going through their garbage and saying they're gay, then they shouldn't have tried to express themselves creatively. I'm like that guy who single-handedly built the rocket & flew to the moon! What was his name? Apollo Creed? 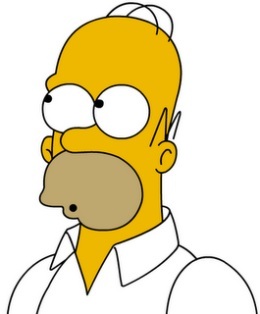 18 quotes by Homer Simpson.